Add a splash of color to your next gift or gift yourself! Do you know a child, adult and/or family that LOVES to paint and make memories together? Then our VIP Pass is the gift for them! 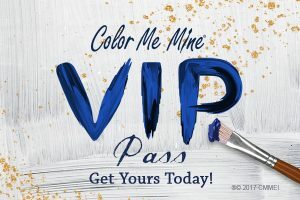 For only $40 (child), $60 (adult), or $125, (family of four) the recipient of our VIP Pass can enjoy painting all year at Color Me Mine Boulder and pay no studio fees, PLUS get 10% off their pottery! It’s bound to add a splash of color and creativity!